The historic Senate Caucus Room was renamed the Kennedy Caucus Room on Monday in honor of the three Kennedy brothers who served in the chamber. WASHINGTON (CNN) - The historic Senate Caucus Room was renamed the Kennedy Caucus Room on Monday in honor of the three Kennedy brothers who served in the chamber, according to a statement by Sens. Chris Dodd and John Kerry. A resolution introduced by Dodd, D-Connecticut, and Kerry, D-Massachusetts, was unanimously passed by the Senate to make the change, the statement said. Both John F. and Robert Kennedy announced their presidential campaigns in the room, the statement said. Earlier this year, the Senate Health, Education, Labor and Pensions Committee chaired by Edward "Ted" Kennedy held hearings in the room on a health-care bill bearing his name, according to the statement. Kennedy was absent due to the brain cancer that claimed his life last month. Dodd said in the statement that affixing the Kennedy name to the Caucus Room would honor "the things that the three Senators Kennedy have done," as well as "the spirit of compassion and compromise, fierce advocacy and tender friendship, that Teddy embodied perhaps more than any other senator of our time." Kerry called the unanimous support for the resolution "equally a tribute to Ted and his brothers who gave so much to our country as well as a reminder to every senator who will ever serve here of the legacy of public service and duty to country that they inherit." 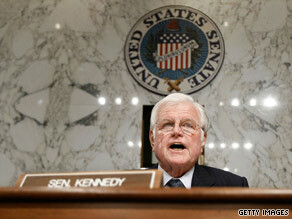 Ted Kennedy was a senator from Massachusetts from 1962 until his recent death. President John F. Kennedy served as a senator from Massachusetts, and Robert F. Kennedy was a senator from New York. Their family is the only one in American history to have three brothers serve in the Senate, the statement said. What a waste of time. There are so many important issues they need to deal with, instead they are grand standing off of Teddys death. Sorry, but Teddy does not deserve the same respect John and Robert. John F. Kennedy would be horrified to see what has become of the Democratic party..............it is now............Ask what your country can do for you! We'll miss the Kennedy's and all their contributions, in DC. Most fitting for three Americans who served this country and gave so much.